In a large saucepan, heat olive oil over medium high heat. Add sausage and brown using spatula to break into pieces. Add onion and garlic; cook about 5 more minutes to soften. Add tomatoes, tomato paste, and wine. Stir in oregano, basil, salt, sugar, and red pepper flakes. Simmer sauce for 20 minutes, stirring occasionally. While sauce is cooking combine all ingredients for the filling in a food processor and blend to combine, about 1 minute. Spray a cupcake pan with cooking spray. Press one wonton wrapper into each cup. Top each with a heaping Tbsp of sauce and a tsp of cheese mixture. Top each cup with another wonton wrapper and repeat with sauce and cheese. 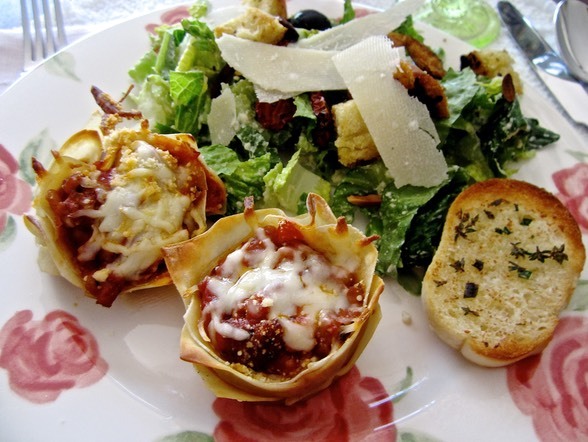 Add one more wonton wrapper, top with sauce and sprinkle with mozzarella cheese. Bake for 15 to 20 minutes until filling is hot and cheese is melted. Remove pan from oven and allow cupcakes to rest for 5 minutes before using a spoon to pop each cupcake out onto a serving plate.